We are now coming to the dedicated terminal building for the famous 'JANET AIRLINES', which transports Area 51 employees to and from the EG&G terminal at Las Vegas McCarran Airport in government owned Boeing 737-200's. In the right background we can see small buildings with grayish fronts. These are Dormitories for workers that stay on base during the week. There is a total of 33 dormitory buildings set up mostly in North to South orientation. The number of dormitories indicates just how many people actually 'stay' here. Left of these, the white colored building is the Precision Measurement Instrumentation Lab (PMEL) and Photo Lab (Building 410). Left and in front of the PMEL, brown in color, is the Janet Terminal Building. A couple of Janets are parked on the ramp to its left. 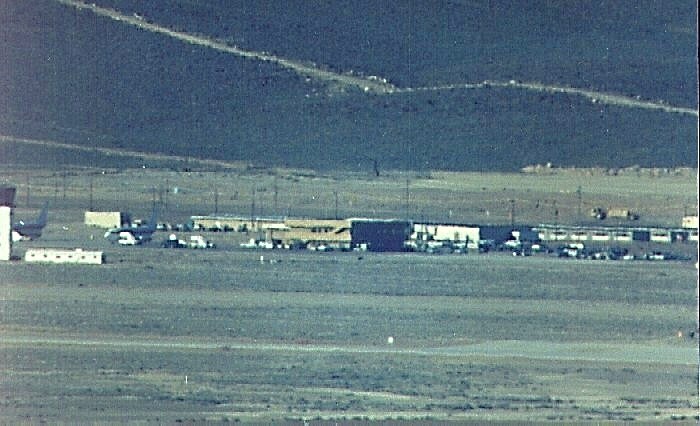 The Area 51 tower is partially visible on the right edge of the frame. Left of the Janet terminal and behind it, surrounded by parked cars, is the Security Building. This is the main operations center for the infamous Cammo Dudes. The vehicles in front of the building are security vehicles.